The sound was different, it wasn’t the constant thumping we had been hearing for nearly forty hours. It was a softer sound and I recognized it right away, snow. 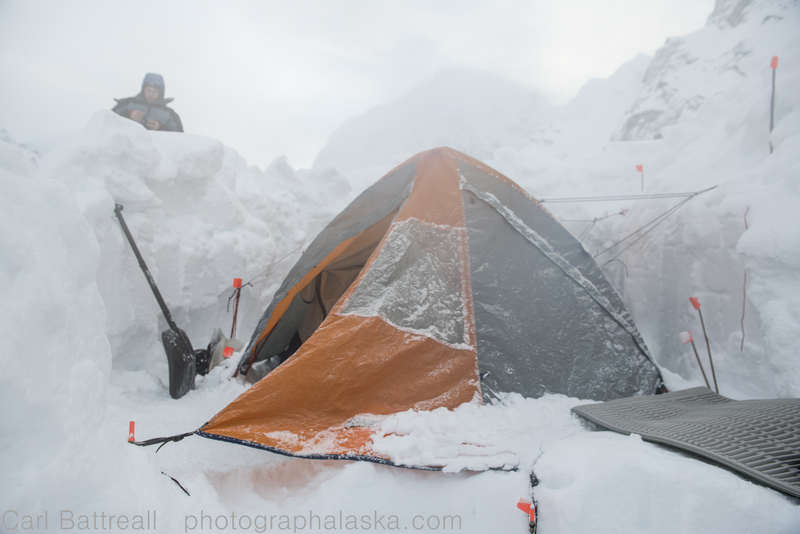 I peeked out of the tent and felt the wet snow pelt my face, it was starting to stick, cooling the fire-red tundra. The day before was a test of character. It rained the entire night before and continued to rain throughout the day, without a break. I spent the morning in the cook shelter brewing tea and listening to music. I watched the little battery symbol on my Ipod as it slowly reached its end, finally turning red. I became very selective of each song, knowing any one of them could be the last. Jeff Buckley’s Hallelujah would be the last song of the trip, fitting I thought. “let’s go hiking then” I responded. “I don’t want to get soaked.” he grumbled. So we had lunch and I then a reluctantly put on all my rain gear and committed myself to being wet. I followed a gentle creek up into the mountains. The bed was a jumble of interesting, colorful rocks. I made some hasty images, trying to keep my gear from getting completely soaked. Once I reached the snow line I traversed into the fog, skirting around rotten spires of black rock. I then travelled down a long soggy ridge back to camp. The rain had let up a little and Barry was wandering around outside trying his hardest not to go insane. We had an early dinner and reluctantly returned to the tent for a long restless night. The snow was a welcomed change, anything was better than rain. We made breakfast and packed up the drenched tent. 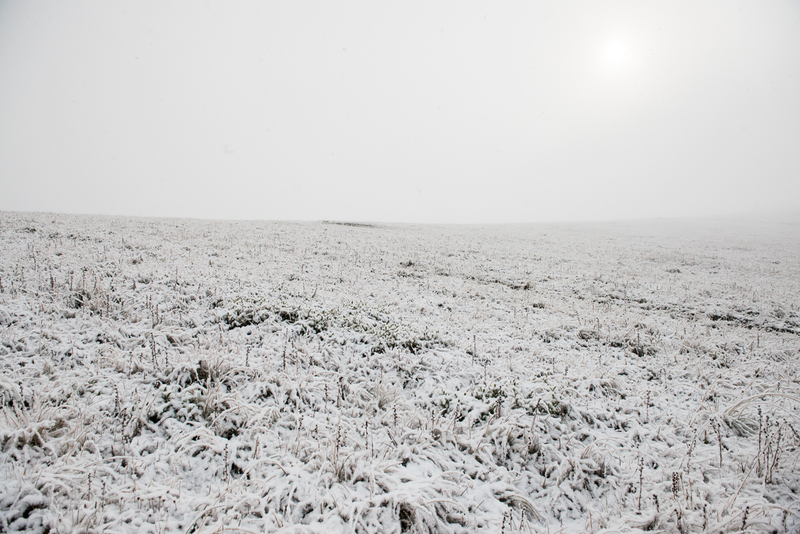 We travelled back across the plateau in whiteout conditions. I focused on trying to not fall into one of the many soggy holes that were now hidden under the snow. We didn’t see any caribou this time, but I am sure they heard us. We returned to our camp site down in the valley. We called our pilot on our SAT phone and let him know that we were back at the pick up spot. It was now going to be a waiting game, waiting for the weather to improve and then waiting for the sound of the Super Cub. During dinner the wolves began their serenade and I decided I was going to see if I could find them and if I was lucky, get their pictures. Near the edge of the far bank I came across some new tracks, bear tracks. These were the first signs of bears I had found during the whole trip. As I explored, the fog level sank down to the ground. It was getting dark and difficult to see, with my recently acquired knowledge of our other valley resident, I figured it was prudent that I return to camp.The wolves would stay elusive. We both slept well and we were excited with the prospect of flying out the next day. Around 5:30am I heard the wolves again. Like a siren call, I slowly dragged myself out of my warm cocoon. I didn’t expect to see the wolves but I figured I would see if the fog bank was any higher. I was shocked to see clear skies. I quickly began packing my gear, I needed to have all my stuff packed and at the pick-up site before I ran off to take pictures, just in case the airplane came. The light was getting wild, I cursed as the mountains began to glow a scarlet red. I lugged my poorly packed pack with random pieces of gear dangling off like Medusa’s snakes. I dropped it at the landing strip and then ran to the other side of the valley. I needed to get up on the ridge before the sun came up over the horizon. As difficult as it was I knew I had to sacrifice the alpenglow on the mountains in order to make it up onto the ridge before the sunrise. My legs burned as I struggled up the steep bank. I was wearing way too many clothes but I knew I would cool down once I got to the top. I had my camera, a lens and my tripod. I had a put few bars in my pocket for breakfast on the run. I reached the top, sweating profusely. After a quick look around I began the process of trying to find a good composition for the light that was about to arrive. I watched the light hitting the mountains and tried to predict where it would hit along the ridge. The fantastic light arrives on the ridge. This is the game you play in the mountains. You can either find a great composition and wait, hoping the light hits it right or you can wait for the light and then find a subject that goes with it. The late Galen Rowell used to talk a lot about light, how the light choose what he was going to make images of. I try to straddle both styles, get myself into a place I think might work and then if it doesn’t, be ready to abandon my previsualized image and chase the light. Looking north into the valley where we were camped. And chase the light I did. When the light finally arrived i realized my precomposed image wasn’t going to work. So I darted up and down the ridge making photographs in all directions, finding subjects that fit the light. looking north-east, the clouds would soon engulf us. After over an hour of intense image making, I took a break and ate something. The fog was beginning to form off to the east and soon the sun got absorbed. My concern about the light quickly changed to concern on whether the pilot was gong to make it before the flight window closed. Fall colors were just beginning to hit their prime. Last image before the fog rolled in. I headed down the steep ridge and met up with Barry at the landing spot. Fog was coming in but there was still a big blue hole above us and all the mountains could still be seen. After a few minutes the plane arrived. Barry went first. I wanted a little time to myself in mountains, some time to reflect about the trip and maybe get a chance to see those wolves, but they would remain ghosts with only their eerie song embedded in my memory. I thanked them loudly for waking me up that morning, but the only response was my own voice echoing off the mountains. Can you see the Whale’s tail? The large glacier on the upper left is the Tokositna, the other large glacier is the Ruth. Backside Glacier and lake are where the Ruth makes a hard left around the great granite spires of the Ruth Gorge. Finally prepping for my next trip into the Alaska Range. 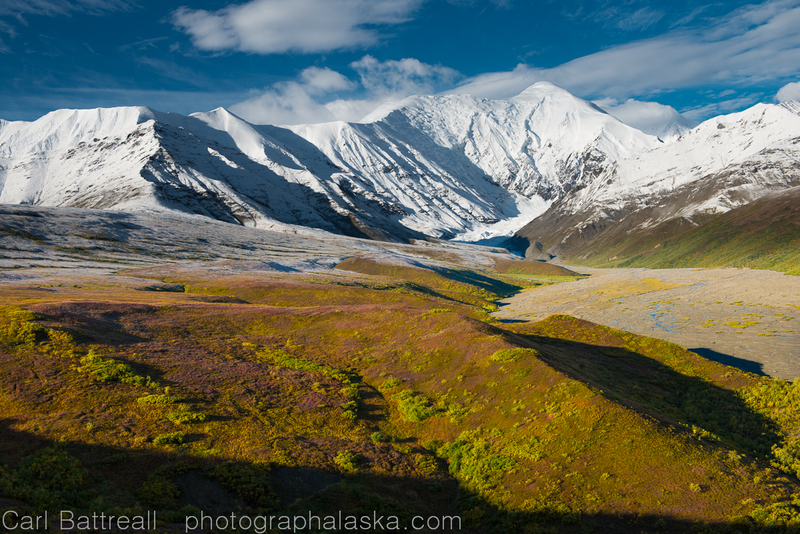 Returning to the central Alaska Range, not too far from my March, Kahiltna Glacier trip. I will be landing on Backside Lake, the terminal moraine lake of the Backside Glacier. 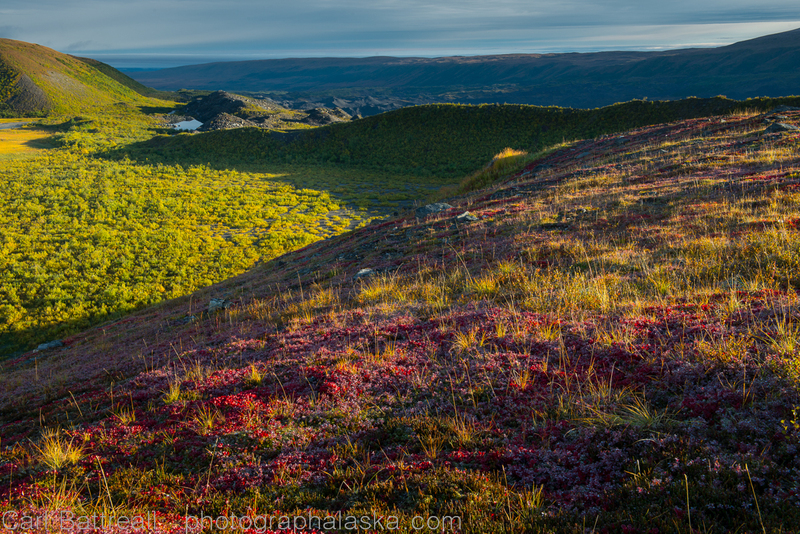 I plan to trek over to the Tokositna for a few days, heading up glacier towards the base of Mount Huntington. Then return and a spend a few more days on Backside Glacier and possibly the Ruth Glacier. I will also be doing some guiding with Alaska Range Project sponsor Alaska Alpine Adventures on the tail end of the trip. 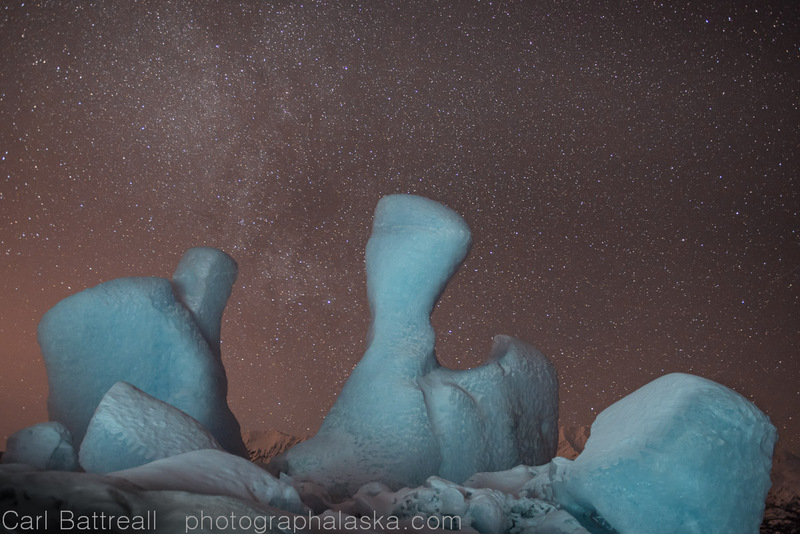 This area is locally known as the Whale’s Tail. 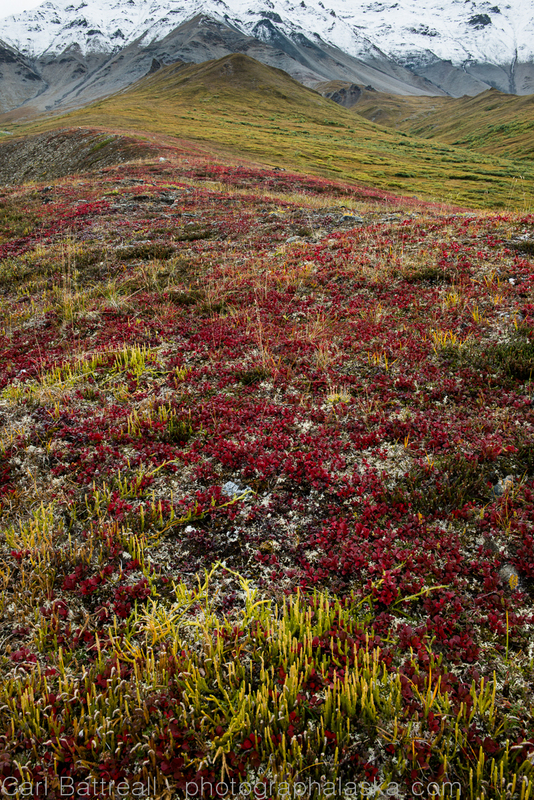 A unique area of rolling tundra in-between the Ruth and Tokositna Glaciers. In partnership with Adventurers and Scientists for Conservation and with guidance from mountain legend and scientist Roman Dial, I will be contributing to two different scientific projects. I will be collecting water samples on the Backside Glacier, the terminal outlet water from the glacier, Backside Lake and down stream from the lake. 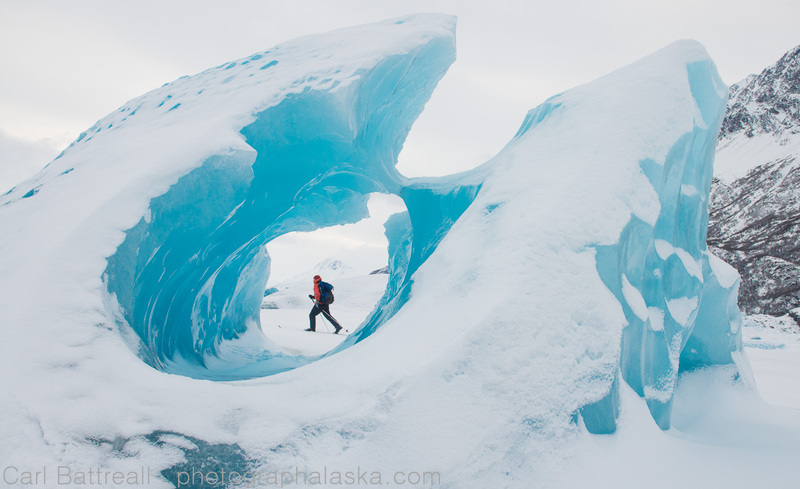 I will also be searching for ice worms on the Backside and Tokositna Glaciers. 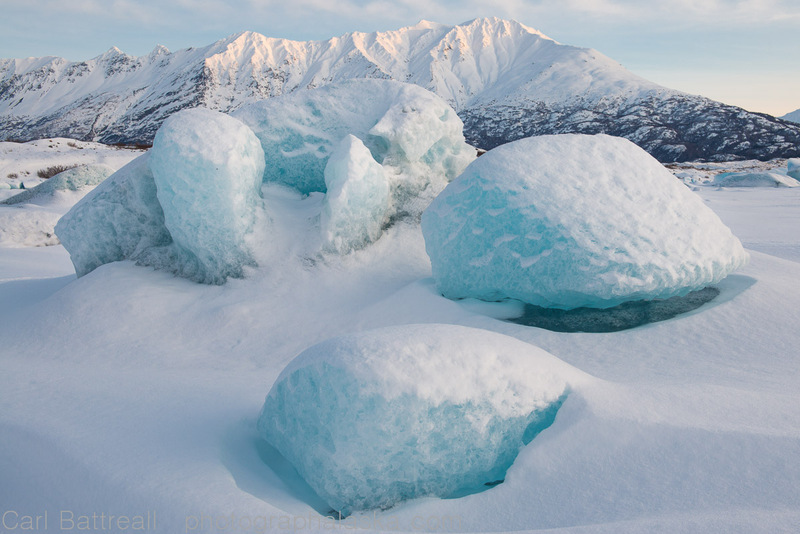 We had a really late, cold spring here in south-central Alaska, followed by a record warm June! I have no idea what the conditions will be like or the snow level, which will determine how far up the glaciers I will get. The Backside Lake just opened up last week. I will bringing my two lens system, the Nikon 24-70 and the 70-200 f4. The body will be the D800E. I will also have my good old Gitzo Mountaineer with my trusty old Linhoff Head. 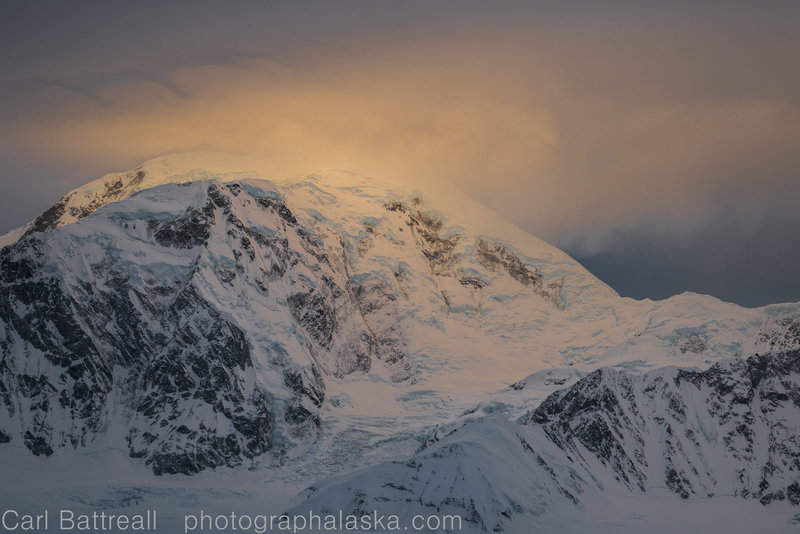 Strange light on Mount Foraker, Where is the light coming from? 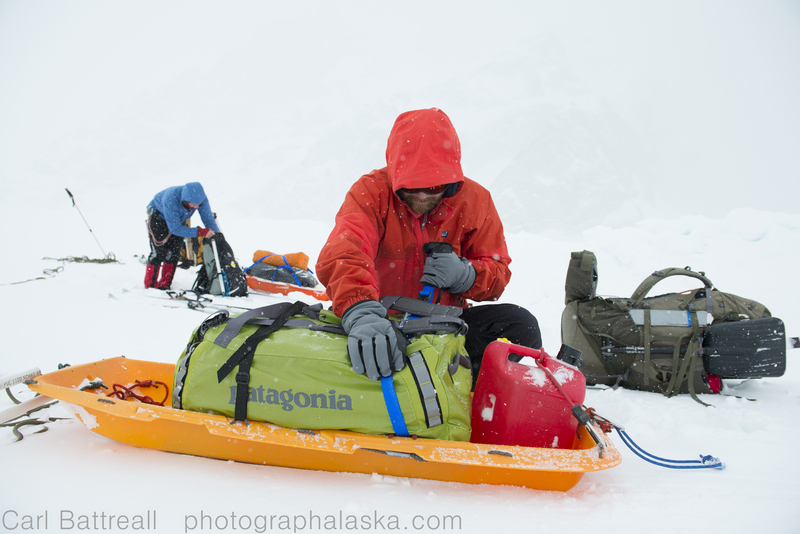 “There is some cool light on Foraker.” Chris said as he fiddled with the stove outside of the tent. I quickly scrambled, putting on my numerous layers. 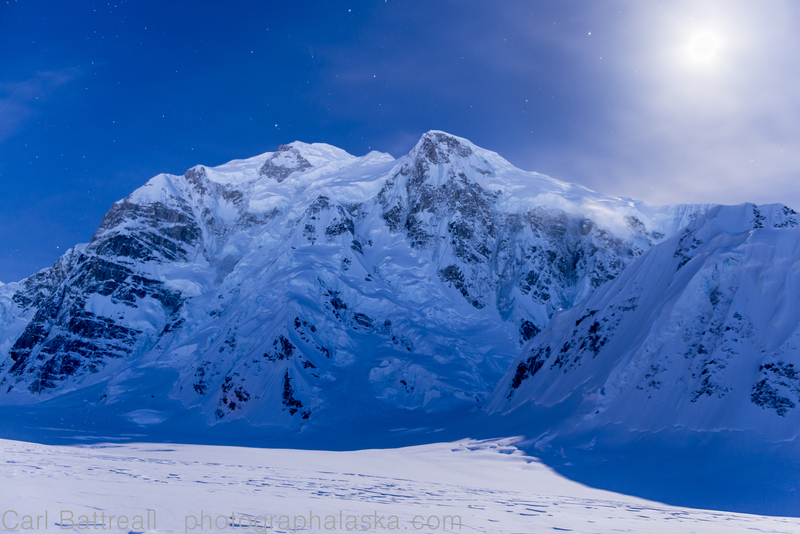 The light was unique, like Mount Foraker was creating it from within. I took a few images but then became more concerned by the obvious decline in the weather, Denali and Hunter were lost in the clouds and little flakes were being spit from the sky. After breakfast we roped up and decided to try and push up the Kahiltna as far as we could. I was still worried about the camera and the previous day’s failure. One idea I had was that it could have been the lens I rented, maybe there was and issue between it and the camera? I left it at camp and just took my 24-70. We worked our way up the glacier, past Mount Crosson and then Peak Farline. The weather got worse the higher we went up, I was having trouble seeing, the whiteout was getting worse. We decided to turn around and head back to camp. The storm grew, a strong breeze was now coming up the Kahiltna, but no snow, only the little crystals being blown off the mountains. We hunkered down early, this time I took Chris’s advice and put a warm water bottle at the bottom of my sleeping bag, that helped and I got a better night sleep. We woke up to full-on conditions. It was blowing hard, the temps were cold, breaking down camp was tough. We headed straight into the wind, we figured a steady 10MPH with guts around 30MPH. After about twenty minutes, face masks went on, frost bite was a serious concern. I busted trail into the wind, the tips of my skis were all I could see. After and hour or so I realized that it was dumb to keep pushing through the weather. 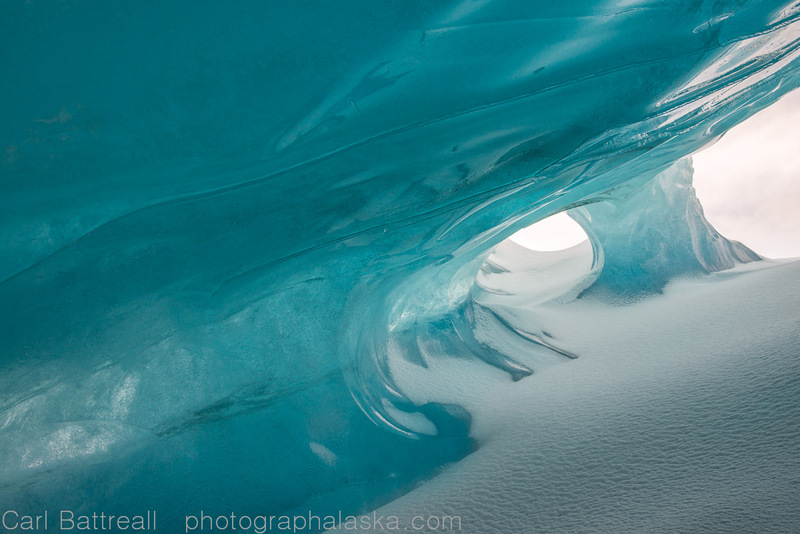 We needed to either dig a snow cave right into the glacier or try to find safe shelter along the flanks of Mount Hunter. 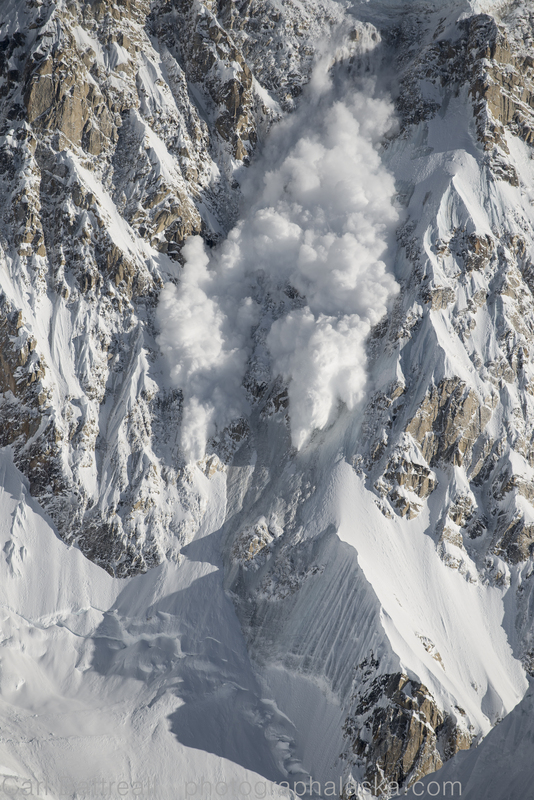 Those avalanches we witness were very fresh in our minds, hanging ice dripped off Mount Hunter’s flanks. Evey once in a while I would see hints of Mount Hunter. I looked desperately for a rocky area that had nothing ominous hanging above it. The ambient temp was around -10f, add gust of 30 or so and we were playing around in -40F conditions, the safety barrier had been reached. We headed to the safest spot we could find and dug in, crossing our fingers we didn’t miss something hiding above us. Needless to say, photography was not happening. Dug a quick camp out of the wind, under one of Hunter’s many rocky arms. The wind died down that evening as we brewed up and ate dinner. I passed the time cutting awesome blocks in the wind-hammered snow. Once hot water bottles were filled, we got in our bags and called it a night. Making camp in full-on conditions. Chris braving bare hands! That night we called my wife Pam on the satellite phone in order to get a forecast. “We are getting dumped on, at least a foot so far” she said, figuring we were being buried alive. “No snow here, just really windy and cold.” She was surprised. “Get cold?! ” I said, “It’s cold enough!”. 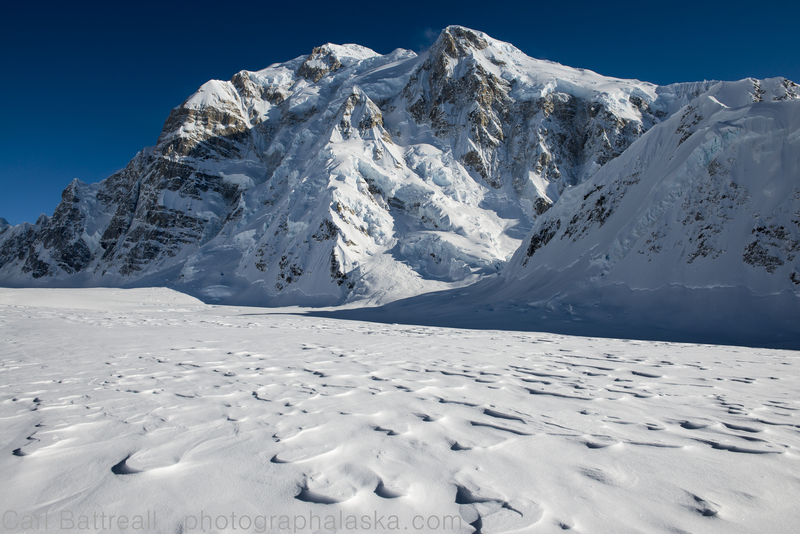 We knew if we had good weather tomorrow we needed to get through the icefall, it would be really hard to find that smooth path in a total whiteout and we all knew a crevasse fall in those temperatures would turn our little photo trip into a survival epic. 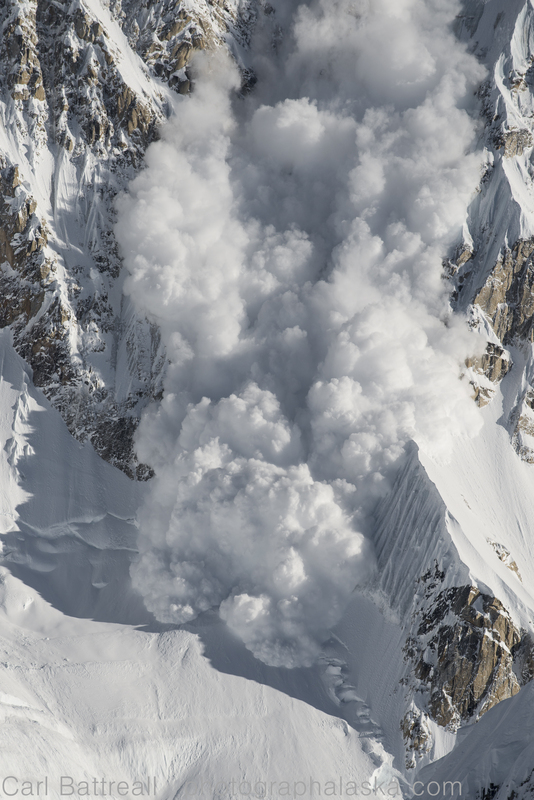 The North face of Mount Hunter, One of the most beautiful mountains faces in the world. It was snowing when I woke up and all I could think was “How many days do we sit around Talkeenta, waiting to fly, before we call it quits?” I kept checking the forecast, it looked bad, really bad. Chris and Sy arrived in a car packed to the gills, yet, somehow we managed to squeeze two more sleds, another duffel, pack, skis and myself inside. We left town in a whiteout, counting how many cars were in the ditch along the way. As we headed north we began to see changes in the weather, a little blue here, a little there and then wham! Blue sky and Denali, clear as could be. Our speed picked up and our conversations became more positive and full of excitement. 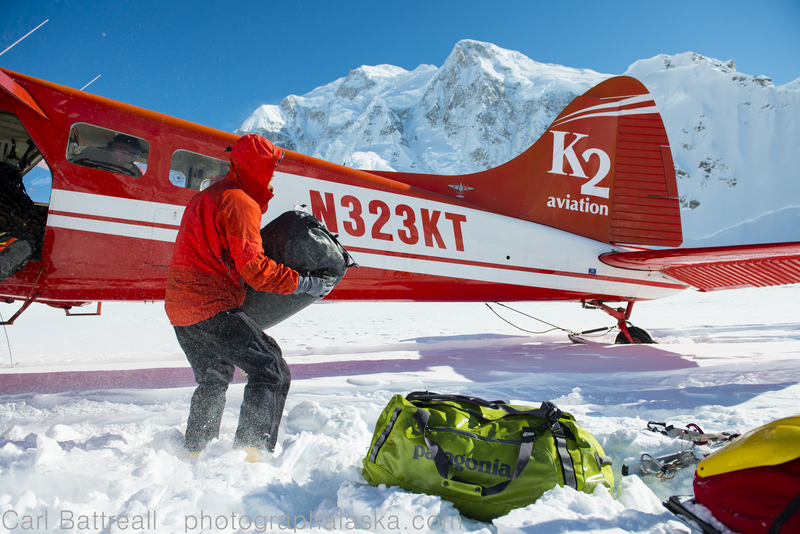 We arrived at K2 Aviation around 11:15. “I am going to take some tourist up first and will check out the conditions.” Randy our pilot, told us. “Go into town and eat, come back in a few hours”. We hated the idea, it was clear, we need to go now, is all we could think. We over stuffed ourselves at the Roadhouse and rushed back to hanger, weighed our gear and stacked it next to the plane. We were excited, we were ready. Randy returned and gave us the green light. We packed the Beaver and loaded up, Sy taking the shotgun seat. Some developing clouds made us nervous but as we left the foot hills and approached the mountains, all fears vanished. We flew over our route, which was important because there is only one way through the Kahiltna icefall, a skinny smooth path. 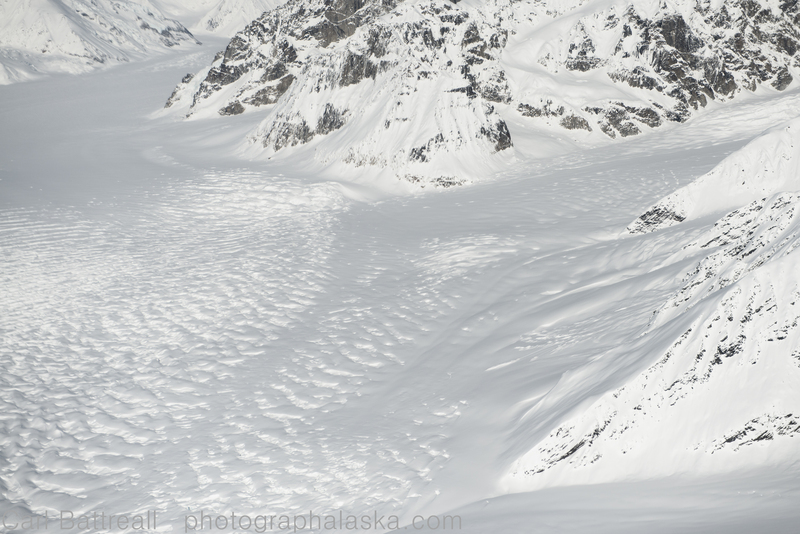 I photographed the route, which was obvious from the air.We flew between the towering walls of Hunter and Foraker and then took a quick right to the South East Fork of the Kahiltna Glacier. 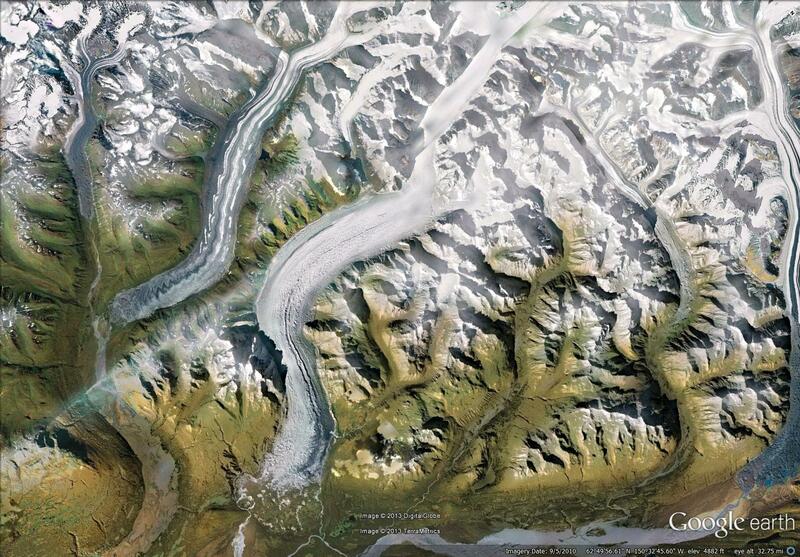 The Kahiltna Glacier is the longest glacier in the entire Alaska Range. 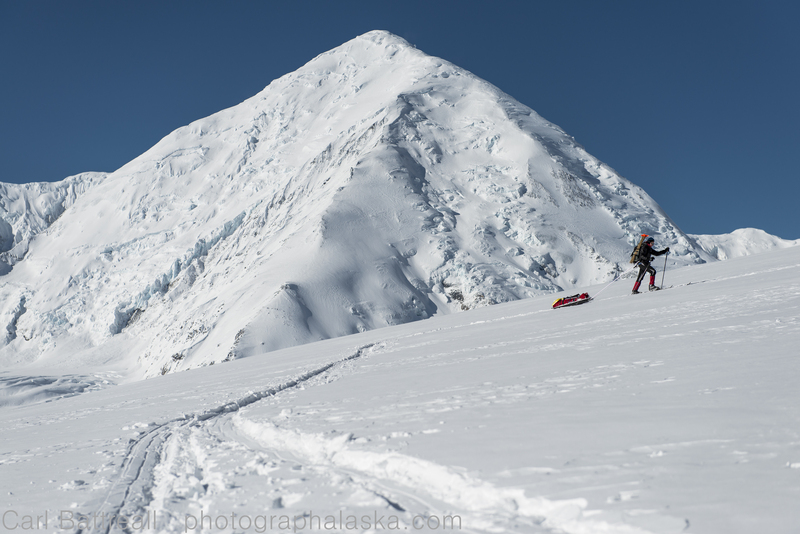 From Kahiltna Pass, it slithers 44 miles (71K) down between Mount Hunter and Mount Foraker and their numerous off-springs. 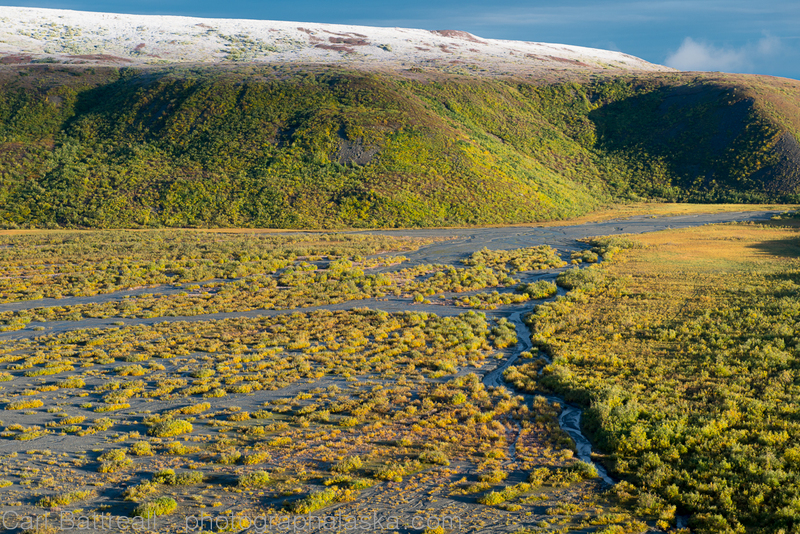 The South East Fork is where the Kahiltna International Airport and base-camp is for those attempting the popular routes on Denali and Foraker. From Late April to Mid July, the place is hopping, with constant air traffic and hundreds of climbers and their tents scattered about. I have always wanted to go to the Kahiltna but was never interested in climbing the western routes on Denali and had no interest in being in the mountains with literally hundreds of others climbers. This is the main reason I decided to go in March, solitude. Our goal was to climb up to Kahiltna pass and ski and photograph the entire length of the Kahiltna, getting picked up at the Pika Glacier. The Beaver sank into the deep snow as it slowed to a halt, Randy spun the plane around quickly, pointing it down hill. It was sunny and beautiful, the temp was a balmy -5F. Before we knew it, The beaver was gone, just a roar echoing through the mountains. 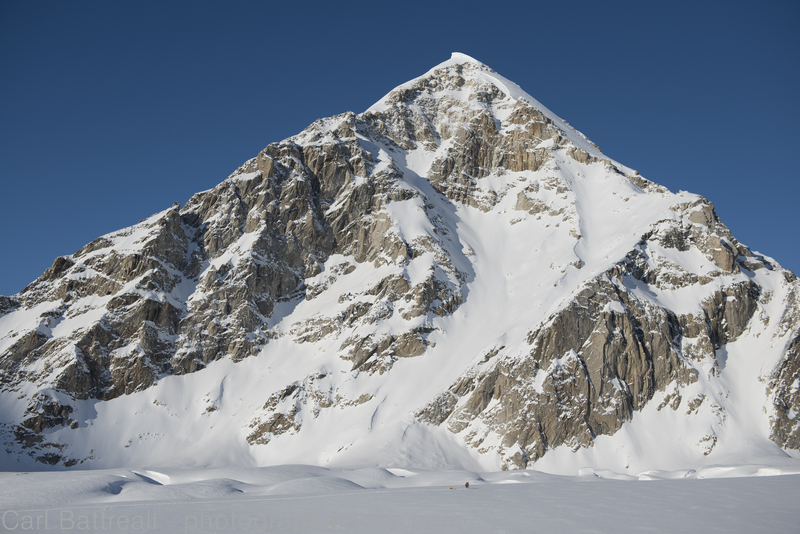 The north face of Mount Hunter was amazing, huge and so close, its beauty made it hard to focus on getting packed and moving up the hill to establish a camp. I was excited, it was clear, there could be good sunset light, maybe even aurora? We passed a strange cache site and wondered if someone else was out in the mountains. All the famous solo climbers were gone for the season. 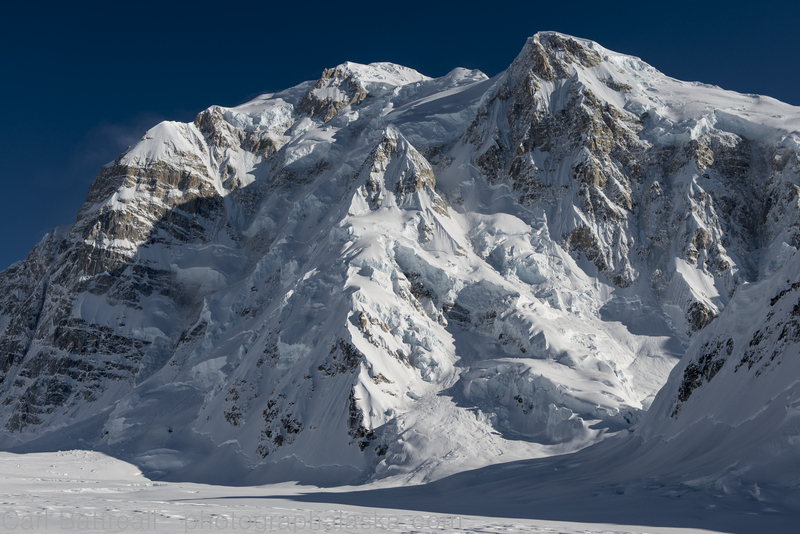 We found a great spot with straight shots of Denali, Foraker and the fantastic Mount Hunter. Sy and Chris dug in, allowing me the opportunity to photograph. They would dig a few feet, probe for crevasses and dig some more. Within a few hours we had a fortified camp and hot water was brewing. 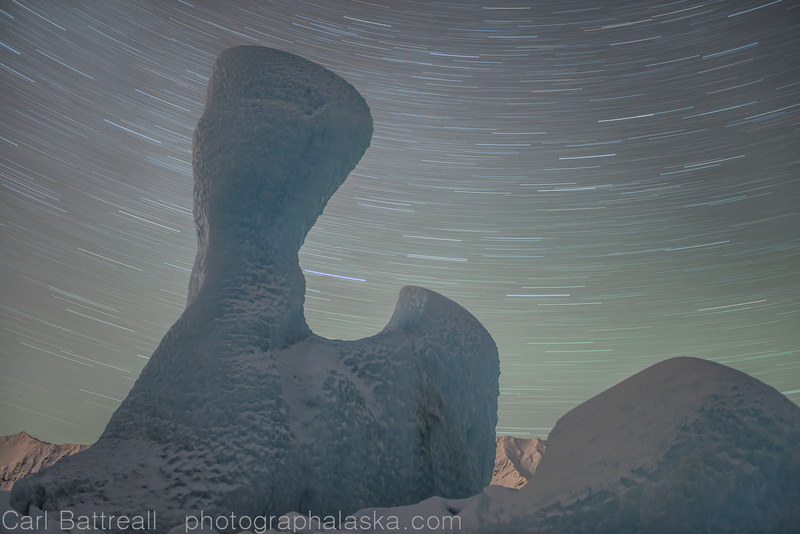 A stiff breeze was coming down the glacier and the temps were creeping lower. Chris skiing to camp one. Mount Crosson in the background. Another of Mount Hunter. I just couldn’t get enough of that mountain! 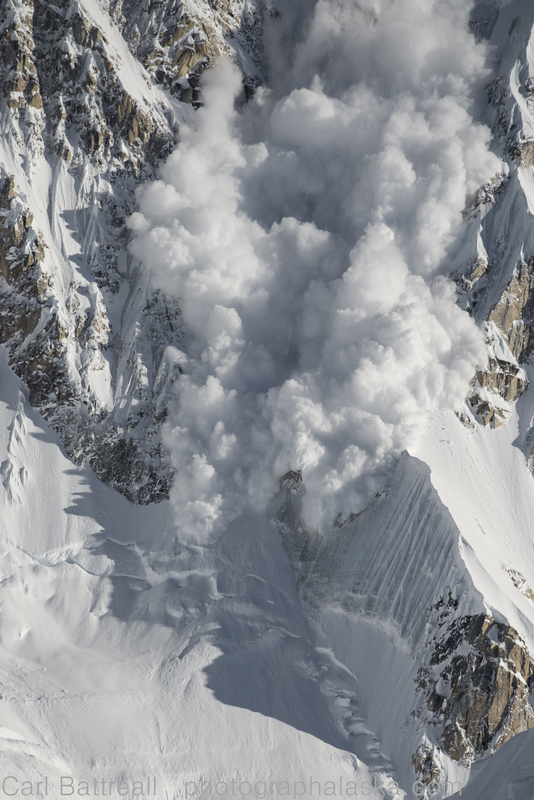 All was quiet except for the thunderous avalanches that would pour down Hunter’s north face. I positioned my camera, mounted on a tripod, right at the area that was most active and waited. 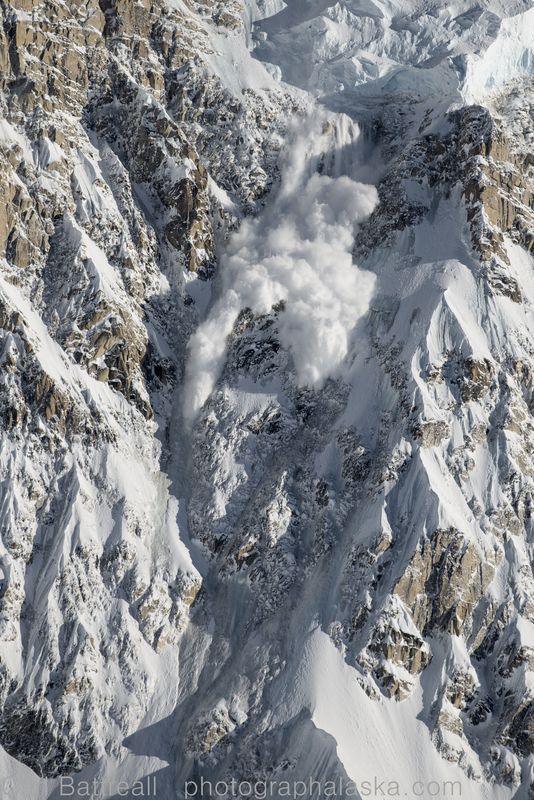 Then perfectly, while I was looking through the viewfinder a huge ice avalanche erupted, I got the entire sequence. However, when I went to take another photograph, the camera said “This card cannot be used”, and the Err signal kept repeating. I turned off the camera, same thing. I switched over to my second card slot, back to normal. “That was weird” I thought to myself. We decided to do a quick ski down the glacier to warm ourselves up a little. On the way down we saw the soloist heading towards his cache, he was moving painfully slow, dragging a sled with huge poles suspended from his shoulders (they were in case he fell into a crevasses.) We waved and continued our ski. 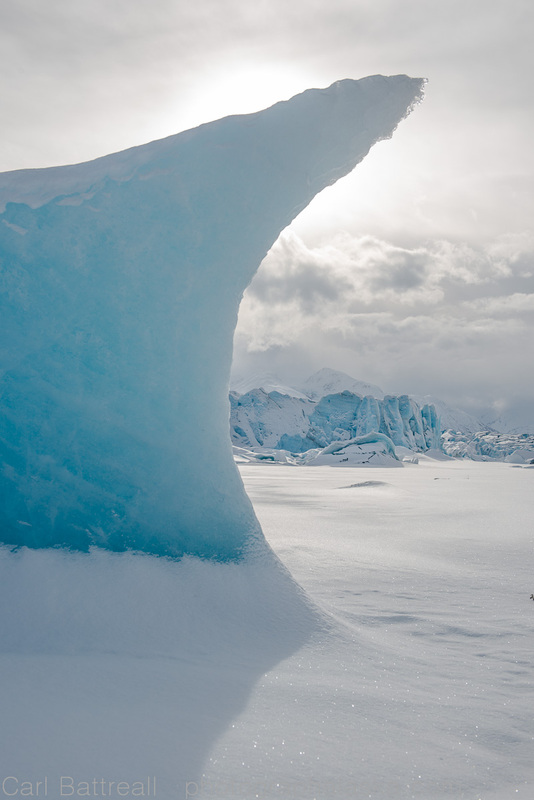 The sun began to dip behind the massive Foraker and the temperatures plummeted. -10f, -15f, -20f. The funny things was, we were all warm, full of excitement and warm from our ski and hot drinks. 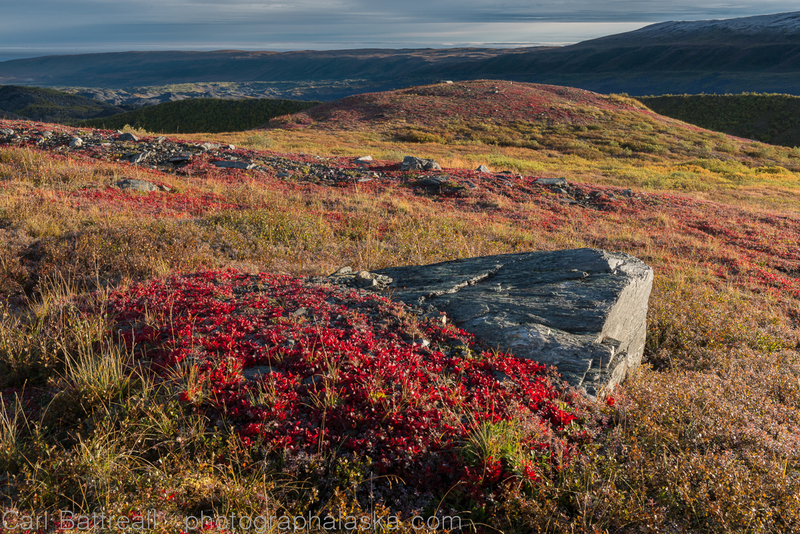 I started taking photographs of the fading light on Mount Hunter and then, Err, what? I turned off the camera and started again, Err. I took the card out and reloaded it, Err. “What the Hell!” switched batteries, Err. Sometimes the camera would fire and then make a strange noise then Err. No images were being recorded. The camera was fried! I was panicking, couldn’t figure out what was going on. The batteries were warm, fully charged. It was the camera itself, was it just too cold? I took the hand warmers I had, stuck them to the camera, put it in the case and shoved in my sleeping bag, hoping that it just needed to warm up a little. 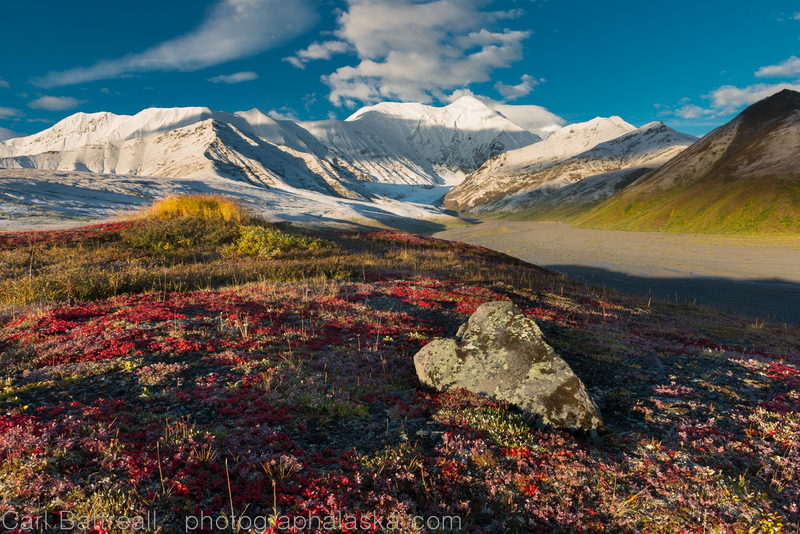 The light faded fast and Denali began to turn red. I pull the camera out, Err! “F#*@” I paced around camp, trying to figure out what was happening. “Hey Carl, you still have your sun glasses on.” Sy informed me. I took them off and opened my plastic glasses case, snap, it shattered into pieces.”It must be cold.” I thought to myself. I had brought a few freezed dried meals that a friend left me last summer after he had climbed Denali. I usually don’t like freezed dried meals but I wasn’t really craving anything and I figured I get one of the out-of-the-way. I sealed it up tight and put it inside my DAS parka. We sat quiet and admired the emerging stars and the glow of the rising moon. All of a sudden I looked down and I was covered in Kathmandu Curry, the freezed dried meal had leaked. I was really a wreck, everything was going wrong and we had just got there! In a few minutes I was able to just brush off the now frozen food on the outside of my pants, though the inside of my jacket and numerous layers were still wet and smelt like Nepal. I went into the tent, I had to figure out what was happening with the camera. Okay, I took the cards and the battery out. I let it sit. Put the battery and the cards back in. Checked the photos I had already taken, good, I hadn’t lost anything. Tried to take a photo, Err. “Okay Carl, step by step, we have been a pro for twenty years, we can figure this out” I assured myself. ” It’s not recording images, why? Maybe its the shutter or the aperture on the lens is stuck?” I took the lens off. Put the camera in full manual and fired a few shots, shutter was working. Looked on the back and reviewed the images, they had recorded, okay. I put my other lens on (I had, at the last moment, decided to rent a second lens, the 70-200mm f4, to shoot details of mountains). Switched the lens (my 24-70) to manual focus. Fired are few frames, it was working. I rushed outside and shot a few, hastily composed night shots, the camera worked. The images had been recorded. The night was mind-blowing. The near full moon lit the mountains up like daylight, we all watched in awe. “Its 11:30!” Chris said. With those words the spell of the night and mountains broke and we all began to feel the cold. We rushed into our tent and settled in for a cold, restless night. 1. Nikon D800E. I have had this camera for a few months and it is by far the best digital camera I have ever owned, period. It has way too many buttons and menus, like most digital cameras, but its image quality is superb. I will be writing a full review of the camera after the trip. 2. Nikon 24-70 f2.8. The D800E needs the best glass possible and the 24-70 fits the bill. I rarely take more than one lens on any trip and this is usually the one. I will also be reviewing this lens and it’s performance with the D800E. 3. My 12-year-old Gitzo mountaineer tripod. I can’t even remember which one it is. It has a Linhof head on it. 4. 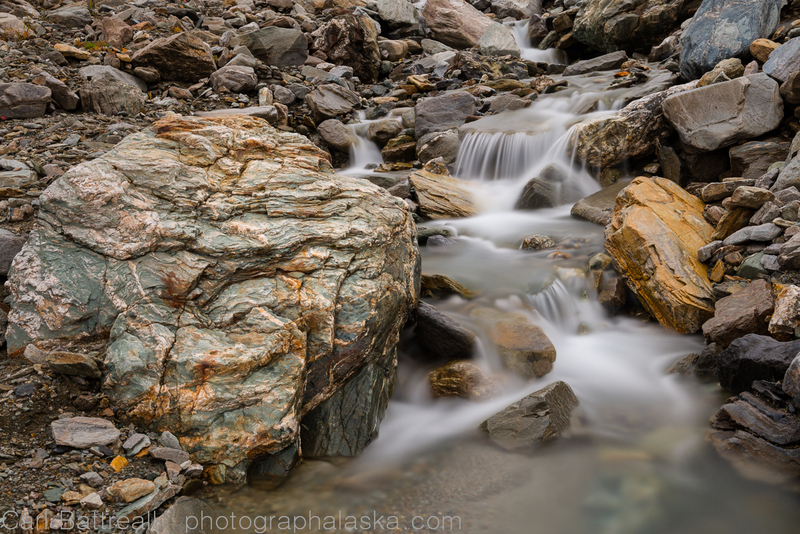 Cable remote, 2 batteries, polarizer filter and a 10 stop ND filter. The filters are both B+W brand. 5. Two media cards,one 32gb Cf and 32gb Sd, installed in the camera. That’s more memory than I will ever need. I am pretty conservative when it comes to image making. Those two cards give me about 800 RAW images. That is enough to last weeks for me. On one trip to the Himalayas I took less than 200 photographs (4×5) in two months. Lots of posts coming up so stay in touch!